Members of Côte d’Ivoire’s delegation pose for a group photo in the Security Council Chamber, where the mandate of the UN peacekeeping mission in that country (UNOCI) was renewed for a final period until 30 June 2017. 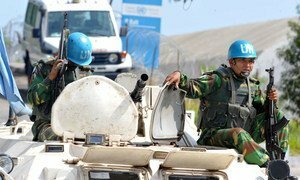 The United Nations Security Council today renewed the mandate of the UN peacekeeping mission in Côte d’Ivoire for a final period, extending it until the end of June next year, and also decided to terminate all arms, travel and financial sanctions against the country, with immediate effect. Welcoming Côte d’Ivoire’s progress in relation to disarmament, demobilization and reintegration and security sector reform, national reconciliation and the fight against impunity, the Security Council unanimously adopted resolution 2284 (2016) deciding that, until 30 April 2017, the mission would be mandated to support efforts by the Ivorian security forces to protect civilians, and by the Government of Côte d’Ivoire to consolidate peace and stability in the country while addressing border security challenges. The 15-member Council also unanimously adopted resolution 2283 (2016), deciding to terminate all arms, travel and financial sanctions against the country, with immediate effect, and to dissolve the Committee established by resolution 1572 (2004) to oversee those measures, and the Group of Experts established under resolution 1584 (2005) to assist that body. The Council also endorsed the Secretary-General’s withdrawal plan for the UN Operation in Côte d’Ivoire (UNOCI), taking into account the security conditions on the ground following the successful conclusion of the presidential election held on 25 October 2015. For his part, Secretary-General Ban Ki-moon welcomed the adoption of the resolutions, reiterating the UN’s continued commitment to Côte d’Ivoire. “The Secretary-General welcomes the determination of the people and the Government of Côte d’Ivoire in overcoming the political and security crises that led to the deployment of UNOCI in April 2004,” Mr. Ban said in a statement attributable to his spokesperson. “It is the continued positive evolution of the situation in Côte d’Ivoire, including the successful conclusion of the presidential elections last year, which has enabled the United Nations to enter the final stage of peacekeeping in the country,” the UN chief said. The Secretary-General recognized the “important role played by partners throughout the Ivorian crises,” in particular the African Union, the Economic Community of West African States (ECOWAS), the troop and police contributing countries and the UN country team, which he said facilitated the achievements made by UNOCI. “The Secretary-General underscores the importance of the continued engagement of all partners during the transformation of the United Nations’ engagement in Côte d’Ivoire over the course of the next year, in particular through the United Nations Country Team, and following the closure of UNOCI,” the statement said. Concerning UNOCI’s mandate, the Council authorized the mission to use all necessary means in carrying out its mandate, and requested that the Secretary-General complete the withdrawal of all its uniformed and civilian components by 30 April 2017. Regarding force structure, the Council decided to decrease UNOCI’s military and police units, with a view to completing their withdrawal. It also decided to extend, until 30 June 2017, the authorization of the French forces to support UNOCI within the limits of their deployment and capabilities. Earlier in April, Under-Secretary-General for Peacekeeping Operations Hervé Ladsous said that with Côte d'Ivoire now firmly anchored on the path of peace, stability and economic recovery, it was perhaps time to consider wrapping up the UN mission and begin to consider the Organization’s future role in supporting and consolidating the country’s gains. In particular, Mr. Ladsous welcomed the Government’s ongoing reforms to the expansion of the political space and strengthening of unity and national cohesion, adding that discussions were under way for the holding of a constitutional referendum planned by the end of the year, and the adoption of a new Constitution that would better reflect developments in Côte d'Ivoire over the past decade. With Côte d'Ivoire now firmly anchored on the path of peace, stability and economic recovery, the top United Nations peacekeeping official today said that it is perhaps time to consider wrapping up the UN mission and begin to consider the Organization’s future role in supporting the consolidating the country’s gains.